I was talking to a Whole30’er the other day who mentioned she had never made homemade mayo. The only thing I could think to say was, “WHAT.” It made me sad, because you’re not really living on the Whole30 until you’ve made your own batch of mayonnaise. For those of you who have experienced the creamy, dreamy goodness that is homemade mayo, you know exactly what I’m talking about. It’s light, it’s fluffy, and when you’re done mixing up a batch, you probably lick the beater just like me. The flavor is so very different than store-bought mayo.  It’s more alive, more richly nuanced, less heavy, and way less gloopy. Once you’ve tried it, you’ll never go back. But making your own mayo is one of those things that sounds so amazingly foodie—something that requires a culinary degree, special utensils, and a subscription to Epicurious. However, nothing could be further from the truth. Making your own mayo is simple—five ingredients, five minutes, and one basic kitchen implement is all it takes. 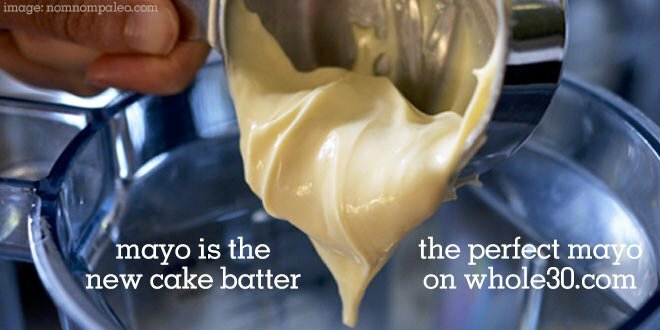 However, not all mayo recipes are created equal, and along the way, I’ve learned that some mayo-making techniques work better than others. 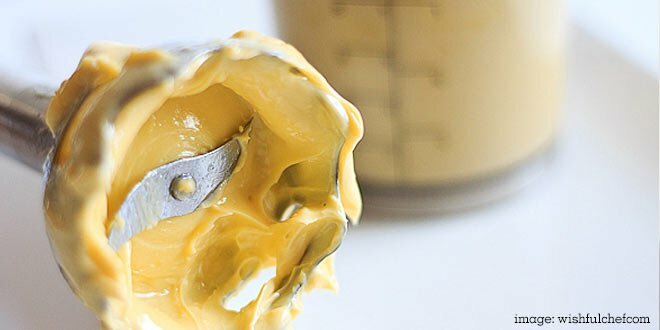 So today, we’re sharing our definitive guide to making your own mayonnaise—the ingredients, the kitchen tools, and a few different ways you can use the finished product in your Whole30 meals. Because ingredients. Need we say more? Our favorite recipe was created by Melissa Joulwan (of Well Fed fame) for our book, It Starts With Food. However, over the years we’ve made a few tweaks, which we thinks help prevent mayo “fails” (when your mixture doesn’t emulsify*). The mustard powder, salt, and lemon juice don’t really matter, but the oil choice does. Choose a light-tasting, light-colored oil; preferably one low in polyunsaturated fat. First, make sure you use light olive oil, not extra-virgin. (The EVOO tastes way too heavy.) You can also use a high-oleic safflower or sunflower oil. The seeds used to make these oils have been bred to contain more healthy monounsaturated fats and less polyunsaturated fats, making their nutrition profile almost identical to olive oil. (Note, this is not the same as genetically modifying the seeds—these are not GMO products.) The flavor of all three of these oils is very mild, making it ideal for mayonnaise. You could use avocado oil, but we find the overall flavor too heavy, and don’t recommend it. Bring it all to room temperature. Listen to me right now: don’t bother busting out a 17-piece food processor just to make mayo. We swear by our stick blender for this recipe (among other things). They’re cordless, far easier to clean up than a blender or food processor, and relatively inexpensive. This Cuisinart is our favorite, at only $35. Also, please don’t try to whisk mayo by hand. I know some recipes say you can do this. Scientific studies (in our house) have proven this is not humanly possible, and will probably give you a newly discovered inflammatory condition called Mayo Elbow. Don’t even bother. You’re welcome. The slower you pour, the thicker the mayo. To get started, you can dump the initial ingredients (the 1/4 cup of oil, egg, mustard powder, and salt) into a bowl or processor and just mix—you don’t have to be careful with the first part. When you get to the “slowly drizzle” part, though, take it seriously. Pour the remaining cup of oil in too fast and you’re left with a soupy, runny mess. The emulsion comes together best when you pour as thin a stream into the bowl as possible. I use a Pyrex spouted measuring cup to make pouring easier, but you can also use a tip from our friend Michelle at Nom Nom Paleo and buy an empty ketchup dispenser to slowly squirt a thin stream of oil into the bowl. Pour. Slowly. So slowly you start to bore yourself. The slower you pour, the thicker your mayo. If you’re using a stick blender, use a stainless steel mixing bowl with a non-skid bottom so you can pour with one hand and mix with the other. (Or place your bowl on a silicone trivet so it stays put.) 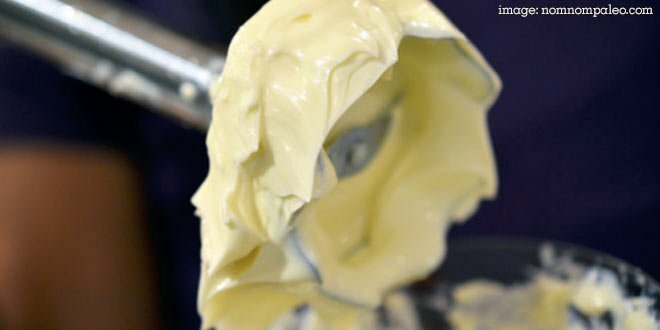 Stay away from copper or aluminum bowls here—the lemon juice can react with the metal and impart a metallic taste into your mayo. Save the lemon juice for the very end. Finally, add your lemon juice as the last step, after your mayo has thickened up. We have no scientific evidence to support this, but our theory is that the acid in the lemon juice can mess with the emulsification process. 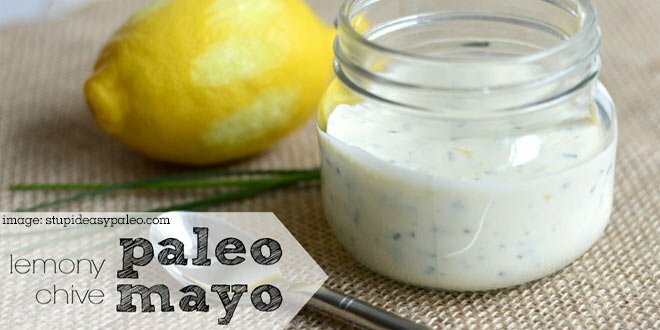 We had far more mayo fails when we added the lemon juice first—but since leaving it until the end, zero problems. We like our mayo really lemon-y, but the more juice you add, the thinner the mixture will become. You can always err on the lighter side and add just a tablespoon now, then add more if a recipe for tartar sauce or ranch dressing calls for it. Generally, fails happen because (a) some ingredients were cold instead of room temperature, or (b) you poured the oil too quickly. If you get all the way through the process and your mayo fails to emulsify, all is not lost. Just use that batch for salad dressings, where it’s less important that the mayo be thick and creamy. The flavor is the same, and you can shake it up before pouring to create a temporary emulsion. 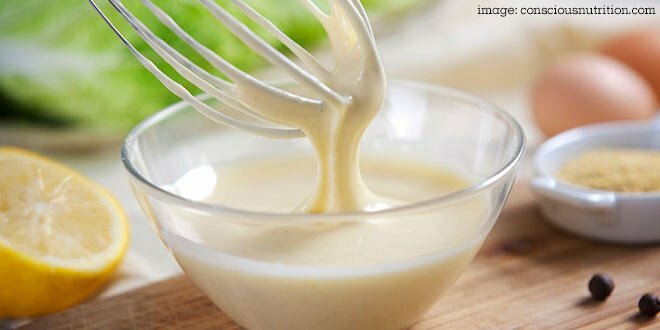 Aside from using homemade mayo the way anyone uses mayo (like in a chicken or tuna salad), you can also turn it into any number of dressings and sauces. 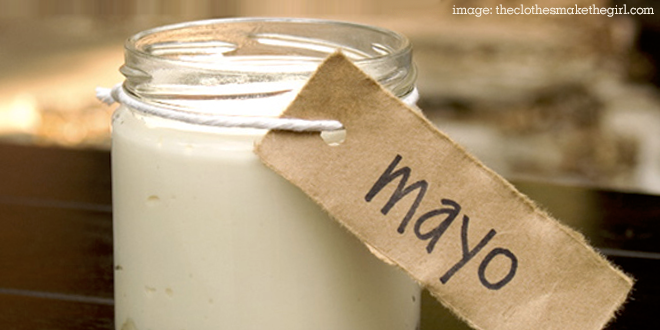 There are also a million different ways to customize the flavor of your mayo for specialty uses. Here are a few of our favorite recipes. Delicious drizzled over salmon or roasted vegetables. From Stupid Easy Paleo. Put ½ cup of the mayo into a bowl. Use a microplane grater to zest the (washed) lemon, and add the zest to the bowl. Add the chopped chives. Stir thoroughly to combine. Add cracked black pepper to taste (optional). Top steak, chicken, or fish, or toss with roasted sweet potatoes. Inspired by Epicurious.com. Place all ingredients in a bowl and mix until blended. Store covered in the refrigerator. You’ll never miss the buttermilk; makes about ½ cup. 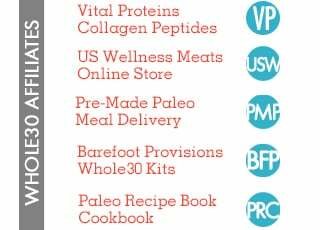 From Well Fed: Paleo Recipes for People Who Love to Eat. In a small bowl, mix the garlic, paprika, parsley, chives, and mayo with a fork. Drizzle in the lemon juice while continuing to mix, then taste and season with salt and pepper. If your dressing is too thick, add either lemon juice or water — ¼ teaspoon at a time — until it’s the right consistency. Great on heartier salads; makes about ½ cup. Inspired by Primal Palate. Place all ingredients in a bowl and mix until blended. Store covered in the refrigerator. 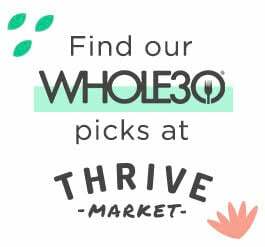 *If you are on the Whole30, read your mustard labels! Many Dijons contain white wine, which rules them out for the program. Makes everyday fish taste special; makes about ½ cup. From It Starts With Food. Place all ingredients in a bowl and mix with a spatula until blended. Allow the flavors to meld for 30 minutes before serv-ing. Store covered in the refrigerator. Makes enough for two side salads or one entree-sized salad. From The Clothes Make The Girl. Crush the dried herbs with your fingers, then add to mayo, along with garlic. Blend well with a fork. Mix in the vinegar, then taste and season with salt and pepper. If your dressing is too thick, add either vinegar or water – a ¼ teaspoon at a time – until it’s the right consistency. Keep in mind that it will get slightly more liquidy as you toss it with your salad ingredients. The perfect veggie dip, or great on chicken breasts. From Nom Nom Paleo. Go make mayo right now.